"Come holiday shop!!!! Grace Avenue UMC in Frisco, TX is having their annual Holiday Bazaar October 19th from 9-4. The event will be held in our new building in conjunction with the Pumpkin Patch, vendor raffle, and bake sale. " Chairs are available. Tables (6FT) are $10 and electricity is $5. For more information, contact their event coordinator at Alicia_Renee_Johnson75@yahoo.com. "Begin and end your holiday shopping with our two dozen local artisans--knitting, soap, glass, wood, custom embroidery, knitting, fine art, candles and lots more. Enjoy the beautiful fall weather and the fresh open space of the farm. Professional storytelling for kids of all ages, photos taken with farm animals, free parking, snacks available, kids' take home crafts. Out in the country, right down the street, in Parker, TX. Booths are 8 X 10 (some variation depending on exact location) for $35. Does not include tables or chairs, lunch or electricity. Please contact us for special needs. For more information, visit their website or contact their event coordinator at ctelisak@juno.com / 214-284-9218. Booths are 9 X 10 and cost $40. Late fee of $35 applies after October 26th, 2013. Tables (6ft) are available for $10. Electricity is $10. For more information, contact their event coordinator at BobcatBazaar@yahoo.com. This fee includes 2 chairs. Electricity is available for an additional $5. Complimentary continental breakfast for our vendors from 7:00-9:00a.m. Curbside assistance loading and unloading. Complimentary coffee & lemonade for our vendors all day. Applications are available here, along with their Rules & Regulations, and are due by October 15th, 2013. For more information, visit their website or contact their event coordinator at bdso5678@gmail.com / Rebekkah - 818-261-2231 / Marie - 817-800-0645 / Natalie - 817-698-5726. "A family-friendly, all-day celebration to kick-off the fall season. Experience a ""county fair"" style atmosphere including music, food, livestock demonstrations, vendors, antique tractor show, hands-on activities, and live music on the Texas Singer-Songwriter Stage. See the new exhibit in the Farrell-Wilson House on the life of Ammie Wilson and the Young family exhibit in the Young House. We will also be celebrating the launch of the new book Never A Good Girl written by HFM curator, Hillary Kidd. Farm activities will run from 11am to 5:30pm, to be followed by a concert by Lone Star Attitude from 6pm to 8pm." Booths are 10 X 10 for $30. Limited slots for electricity available for additional $20. Applications are available here and are due by August 24th, 2013. For more information, visit their website or contact their event coordinator at heritagefarmstead@gmail.com / 972-881-0140. Questions or concerns: Ashley Kidd-Olson: 202-436-0000. Booth fee does include 1 (8 foot table) & 2 chairs. Applications are available here and are due by September 10th, 2013. For more information, visit their website or contact their event coordinator at shopapaloozaladies@yahoo.com / Misty 254-733-0803 / Mindy 254-640-9336. "We're taking people OFF the streets of Deep Ellum because it's too darn hot outside! Come enjoy this *indoor* urban space at the blue building (2625 Main St.) by Lula B's Antiques in Deep Ellum, filled with neighbors, families, and downtown lovers all shopping side by side for fresh food, handmade crafts, vintage goods, and more! " "Sixteen hot-air balloons will take to the air at the 26th annual fest, which will be held in a new location at Unity Park in Highland Village. Expect mass balloon ascensions, balloon glows and tethered balloon rides. You’ll find a kids’ zone, food vendors, arts and crafts booths, live entertainment and more. Free vision screenings for all ages will be available Aug. 16-17, and there will be donation sites for eyeglasses throughout the weekend." Free admission; $5 donation for parking. Off-site parking will be available at Marcus High School, 5707 Morriss Road, Flower Mound, with a free shuttle service to and from Unity Park. 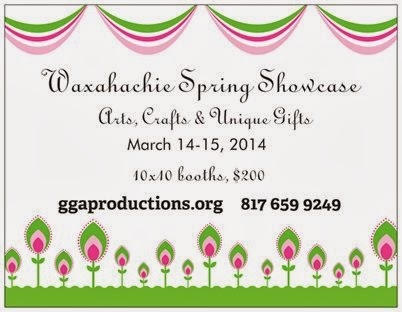 "This is a Craft Show that you don't want to miss! 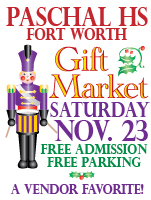 Come join us at the Waxahachie Civic Center for some stress free shopping. 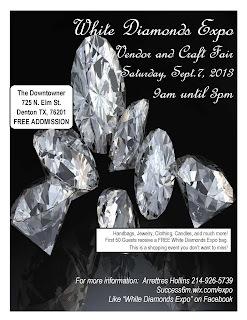 We will have tons of crafts, beauty products, jewelry, clothing and MORE!!" If a 8' table is needed they are $5.00 and are limited to first come. Booths are 6X12 and include free chairs and one free lunch (sandwich, chips and a soda). Additional lunches are $7. High school band students and parent volunteers will help you with set up, tear down and staffing if you need a quick break from your booth. Tables cost $10 each, and electricity fee is $30. Booth price now through Nov. 11th is $90. Booth price Nov. 12th through Nov. 17th is $100. Booth price Nov. 18th through Nov. 21st is $125. Booth price Nov. 22nd and Nov. 23rd is $270. Applications are available here and are due by November 17th, 2013. 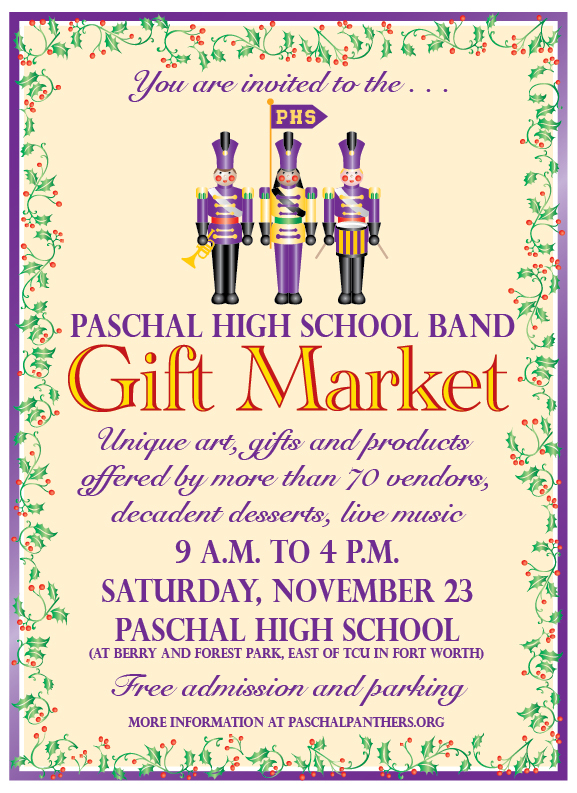 For more information, visit their website or contact their event coordinator at giftmarket@paschalpanthers.org. 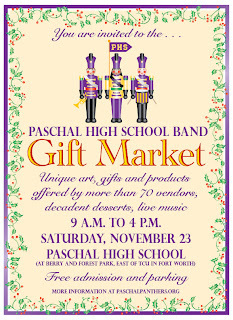 For more information, contact their event coordinator, Paula at PWBandSnflkBazaar@hotmail.com / 214-336-3699. "This year's Lord's Acre will feature food trucks, artisan vendors, carnival games, auctions, etc! Benefiting Local and Global Missions." Booths are an 8ft. table (space will be approximately 10'x5') and 2 chairs for $25 (plus one donated item valued at $25 or more to be used in the Silent Auction or as a door prize). This fee includes one 8ft. table and 2 chairs, electricity if noted on application. For more information, visit their website or contact their event coordinator, Lee-Ann, at edwards4750@sbcglobal.net / 817-991-0256. Booths are an 8ft table and two chairs for $40. Electricity is an additional $25. Wifi included with booth fees. For more information, visit their website or contact their event coordinator at jessica.daisyevents@gmail.com / daisyplanning@yahoo.com / 972-971-8214. Booths are (1) 8ft table and cost $60. Apps received and paid for by September 20th will receive a $10 discount. Booths include 8ft table with 2 chairs and tablecloth. Electricity is $5, extra tables are an extra $12. For more information, contact their event coordinator at renate.jeffcoat@ccasaints.org / 214-608-4798. For more information, visit their website or contact their event coordinator at mungerplacedays@gmail.com. "The 25th Annual Autumn Fest is put on by Little Elm Festival Association who is tasked with raising funds through community events like this one for the development of present and future public parks and facilities. This event normally brings in around 20,000 people and will include 4 days of Carnival Rides and Vendors, with live bands playing locals schools will be out to perform, BBQ cook off, anything that floats contest, Pretty baby contest, 5k run and 1k walk, a firework show, and much more." Booths are 15 X 10 and cost $75. Applications are available here and are due by August 20th, 2013. For more information, visit their website or contact their event coordinator at vendors@littleelmfestival.com. Booths are 10 X 10 and cost $130. Corner booths are limited. Tables are available for $4, chairs $2, and electricity is $100. See application for more information regarding deposits and reserving electricity. "The First United Methodist Church Burleson is holding the 1st annual Feed The Need event on Saturday. The day includes activities and sales to raise funds for the community and mission." A table will be provided that is 5' x 5' along with 2 chairs. Floor space is available and the cost is $40. Please do not bring a lot of items that will take up too much space, but be practical with your sales. You may decorate your table if you wish. This fee includes a table, 2 chairs and electricity, if needed. Applications are available here and are due by September 23rd, 2013. For more information, visit their website or contact their event coordinator at Lisa.Chick@fumcburleson.org. The church office is 817-295-1166, but email is preferred. This fee includes 1 chair. Tables available for rent for $15. Electricity available in select locations for $10. Applications are available here and are due by August 30th, 2013 September 13th, 2013.